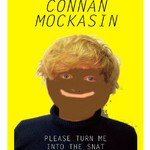 'Please Turn Me Into the Snat' is the debut solo album from the front man / singer / songwriter / guitarist of obscure legendary New Zealand band, Connan and The Mockasins. "Connan is a star in the making." "Connan Mockasin is creating a genre of his own." "Leftfield NZ collective defy description." There is nothing cliché about this chap and his music. Connan is known for his youthful imaginings, bizarre song topics, and brilliant musicianship. Listening to this album is like entering a musical world full of creatures from the Jabberwocky, Monty Python animations and that episode of What Now, when Thingy's eye popped out of his head. Heavily influenced by the blues one can find similarities between Connan and blues legends such as Howling Wolf, or Lead Belly. For those new to Connan you will find an album that's fresh, strange and interesting. For those who heard the Connan and the Moccasins album "Uuu its teasy", this album contains its predecessors familiar charms, but is more polished and mature. The production again is raw and rowdy. So open your mind and your ears, and let Connan Mockasin take you on a musical adventure of wonderment.